Do you need to keep critters away from your herbs? Does tending to your plants make it hard for your back? Then a raised planter like this may be the solution. One of the advantages this planter offers is that your herbs are not planted directly on the ground. Your plants are safe as this makes it difficult for critters to reach them. The height of this planter is ideal for those of you who have mobility issues. It’s easier on your back as you don’t have to hunch over to tend to your plants. This planter sits about 30″ off the ground. If you were unable to have Lowe’s or your local hardware store help out with cutting, you will need to make the cuts to your wood before starting any other aspect of the project. Make sure you remember the golden rule of carpentry – measure twice, cut once. Sand down the corners and edges of your wood. You don’t want to get splinters when you’re working in your garden, so spend some time before you start drilling and sand down the pieces of wood. Spend extra time on the surfaces that will be showing, as you won’t want any snags or large pieces sticking out on those. I used medium grit sandpaper, and sanded down the edges and the flat ends of all my boards, but not on the 4″x4″ posts. If you’d like to do those too, feel free. My saw didn’t leave anything sharp, so I didn’t feel the need to do that. On a flat and level surface, lay out what your planter would look like if it was placed upside-down. This will help you figure out if you have enough space to work, and how the pieces will fit together.Start with the 4″x4″ posts, and stand them up on one edge. Your end boards will go against the two posts, on the outside. You will want the boards to go off the side of the post about 3/4″ so that when you put the longer side boards up, they will meet at a 90 degree angle around the post. 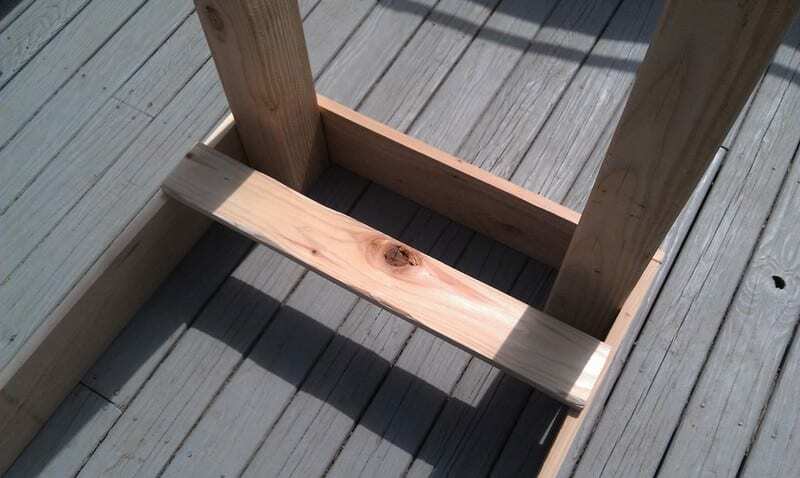 After you have the side boards up, make sure that your width is accurate by placing one of the bottom support 1×4 pieces across the bottom to make sure they fit. Measure your drill holes for your posts. Since you will be using 2″ Hex Bolts on the post, you will need to stagger the holes that you drill so that they do not interfere with each other in the center of the post. Use your measuring tape, mark holes using your pencil at 1.5″ and 4″ from the bottom of your post, at 3″ from the left side. Rotate your post to the right, and then mark holes at 1.5″ and 4″ from the bottom of your post, at 1″ from the left side. This will make sure that your screws do not touch each other in the center of your post. Drill holes in your posts. Using a drill with a 1/2″ bit, drill holes where you marked the measurements. Your holes only need to be 1.5″ deep, since your hex bolt will be going through another board as well. To help make sure you do not go in too deep with the hole, you can make a mark on the drill bit using a marker or a piece of tape. When drilling, make sure your board is held down securely, either by using a work bench with a clamp, or by applying pressure with your leg over a flat surface, like a bench. Drill straight down into the wood and try to keep it as level as possible so you don’t break the drill bit.For every hole that you drilled into your posts, you will need to add in an Insert Nut. These will help make sure that your hex bolts stay in securely. Measure your drill holes for your side boards. First, measure the holes for the long side boards. Using your measuring tape, mark holes using your pencil at 1.5″ and 4″ from the top of the board, at 3″ from the right side. Make sure you mark the holes on the side of the board that will be showing on the outside of the planter. For the shorter side boards, mark holes at 1.5″ and 4″ from the top of the board, at 1.75″ from the right side. The reason for the extra 3/4″ is because the short boards have a slight overhang from the side of the posts. Make sure you mark the holes on the side of the board that will be showing on the outside of the planter. Using a drill with a 1/2″ bit, drill holes where you marked the measurements. Your holes will need to go all the way through these boards since the hex bolts will also be going into the posts. Make sure you drill the holes from the side of the board that will be showing on the outside of the planter towards the side that will not be showing. This will help prevent the board from splintering on the side that will be showing. When drilling, make sure your board is held down securely, either by using a work bench with a clamp, or by applying pressure with your leg over a flat surface, like a bench. Drill straight down into the wood and try to keep it as level as possible so you don’t break the drill bit. Check your hole placement. Line everything back up, like you did in Step 4, and make sure that the holes that you drilled in the boards match up with the holes in the posts. This is the most difficult part of the planter. Chances are, that your measurements will be slightly off, so you will need to make the hole a little larger to accommodate that. Don’t worry about making the hole larger than the head of the hex bolt. You will be using washers between the board and the bolt, so as long as the hole in the wood isn’t larger than the washer, you will be ok.Keep checking the hole placement until they all line up.I had to make a bunch of adjustments to my holes too. You could avoid this issue if you had clamps or vices and could put your post and board together and then use a drill press to drill through both boards. But, chances are that you don’t have one of those. Don’t put the bolts through all the way. You want them to show through to the other side a little bit, but you also want to be able to have enough space on the bolt to thread them into the posts. Once all of your side boards have hex bolts and washers on them, start attaching them to the posts. It is easiest to both side boards to one post, then do the post that is diagonally opposite, so you end up with two “L-shaped” pieces of the planter. Once you have the two “L-shaped” pieces put together, you can attach the longer side boards to the remaining posts. When all of your bolts have been tightened, flip over the planter, and check everything for sturdiness and for whether or not it is level. Just be mindful that you likely won’t get everything to be perfectly level – that’s ok. If you need to straighten out the legs a bit, loosen some of the hex bolts, and move the legs around, then tighten everything one last time while it is standing on the legs. Using a pair of wire cutters or heavy duty shears, cut a 24″x50″ rectangle from your roll of hardware screen. The metal is very sharp, so use caution when cutting this. Attach the hardware screen to the bottom of the planter. Flip the planter back over so that the legs are sticking straight up in the air. Making sure that your screen is centered vertically and horizontally, use your staple gun to staple the screen to the center of all four sideboards.Once the centers are done, you can continue along the length and width of the screen, attaching it to the underside of the planter.You will need to use your wire cutters or heavy duty shears to make a 4″ cut at each corner of the screen so that it fits around the planter. I suggest that you don’t remove the 4″ piece, and instead, just staple it along the inside of the planter leg. Lay out the 1″x4″ boards that will be supporting the bottom. Space them out evenly, but you don’t have to be neurotic and measure. Using your 1.5″ galvanized screws, screw the boards into place. If your boards have knots at the end, try to avoid them. The knots in wood are always the hardest parts, and they don’t like being hammered or screwed into. I found this out the hard way. Flip your planter back over and admire your work! You’re done! You have some options now as to how you want to keep the soil in. I plan on using newspaper, since it’s biodegradable, recyclable, and cheap, but you may want to use something else, like planter liner, or coconut cloth. To keep the cost low use salvaged timber, and build it yourself. Be resourceful, and find materials in your surrounding that you can use as alternative. Thanks to Rhody Life for this great project. Add privacy to your yard by building a beautiful cordwood fence! I think this is a really cool idea but concerned you might need a deeper box for herbs. My understanding is that they have deep roots and would need more soil. Just wondering – the list says only 2 4” x 4” posts? Is this for the legs? If so, there are 4 legs – about 4 (foot high) x 4 (inches wide)! Correct? And what is ‘hardware’ cloth – the screen?